Providing Classical Chamber Soloist and Chamber Ensembles to the High Country of Western NC and Beyond. Specializing in Weddings, Funerals, BBQ's and Bar Mitzvahs. Steve was recommended by our venue and was a great addition to our day! He was friendly and easy to work with. He made sure that all of my requests for our day were met and provided a beautiful experience for our guests. The music was Amazing and we received so many compliments on our ceremony and brunch reception music! If I could do it again, I would hire Steve and his team again and again. We hired Summit Strings for our fall, outdoor wedding. Working with Steve was very easy. He was able to answer all of our questions, make suggestions and was flexible. He was able to accommodate all the songs we asked for including finding the music for some uncommon songs we wanted. On the day of we got so many compliments from guest about how beautiful it was to have them and how they sounded. I would recommend them for any wedding! 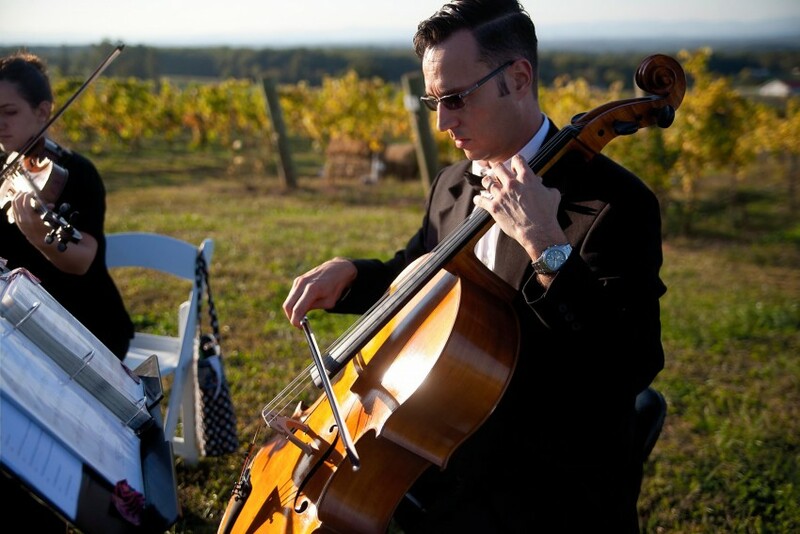 Steve provided beautiful cello music for our wedding ceremony and cocktail hour! He really listened to our vision for the music and worked with us to create it. I highly recommend him for your event! The Summit String Quartet played for both my ceremony and for cocktail hour. They were professional and generous, and their music was gorgeous! I am still getting compliments from my guests on how lovely the music was. They took special requests from me, and even learned a new song in order to play the song I wanted to walk down the aisle to. They went above and beyond in order to make both my ceremony and my cocktail hour perfect, and I cannot recommend them enough. Steve Holman with Summit Strings was wonderful to work with before our wedding and the day of. Steve responded to my request for information right away and provided us a list of classical, modern and pop tunes that we could select from. We sent our in selections a month ahead of our wedding day and Steve was proactive in suggesting alternate pieces best suited for a trio. Steve attended our rehearsal and worked with our officiant to select the right microphone and amplification. He came to our rehearsal prepared and knew our ceremony order and which pieces were to be played when. The day of the wedding Steve and the two other musicians arrived an hour and a half before the ceremony start time and set up two standing microphones, one for the officiant and the other for our readers. The package we selected only included one microphone but Steve was incredibly kind to provide an additional microphone and sound amplification at no extra charge. It may seem like a small thing but the mics and amps were KEY during our outdoor ceremony considering the wind. The music was great during the ceremony and afterwards during the cocktail hour. Our guests loved the cocktail hour pop tunes and had a lot of fun and even sang along during some of the songs! ...and rolls...and does classical...and...well...just about everything. Very talented, professional and gracious. We were very pleased with the quartet music provided at our reception by Summit Strings. Steve and his other violinist were excellent and played beautifully. I would highly recommend them to play for ceremony or reception of any type. We have very high standards for our weddings, and Summit Strings nailed it!! We were very impressed with their performance, as well as their professionalism throughout the entire planning process. Very nice people, beautiful music! We 100% recommend Summit Strings!! We engaged Steve with Summit Strings for our daughters wedding and couldn't have asked for more. The group was very adaptable, accommodating and performed beyond our expectations with very little demand on us beyond their fee. Our song selections included both traditional and contemporary and the quartet performed all exceptionally well. Their sound was excellent as they brought their own sound system, their renditions of the songs selected were spot on and their skill level was also excellent. Overall the wedding/reception was a remarkable event, largely due to the contribution of Summit Strings. Steve and his quartet Summit Strings performed the ceremony/cocktail hour portion of our wedding on 9/23. Leading up to the wedding Steve was very accommodating, taking our specific music requests and suggesting other songs for the cocktail hour. They arrived early to the venue, performed wonderfully, and even provided our officiant with a lapel microphone during the ceremony so our guests could hear him, free of charge. We would highly recommend Steve and his band for any of your future events. Steve Holman is incredibly talented and accommodating. I would recommend him for any cocktail, dining, wedding venue and would certainly hire him again. He played for our daughter's wedding and cocktail hour and we were so impressed with his entire performance and demeanor. Absolutely beautiful. Beautiful String Quartet music for my daughter's wedding. Words cannot express how wonderful Steve Holman and the String Quartet was at my daughter’s wedding. The music was absolutely breath-taking – beyond my expectations. I wish I had another event that I could hire him just so I could hear him play again!! The wedding was in Lake Lure, NC. The setting was the Gazebo on the Lake with the beautiful mountains in the background. “Music is the language of the heart overflowing with emotions. So powerful that it makes us cry, laugh and give us goosebumps.” The Summit Strings filled the mountains and valley with music that was so powerful that it evoked musical memories and heart-throbbing emotions. The music played was chosen as musical memories of the bride and the families. This time and place was a magical moment for all of us. All of the music that was played was chosen by my daughter to evoke life- long special memories. 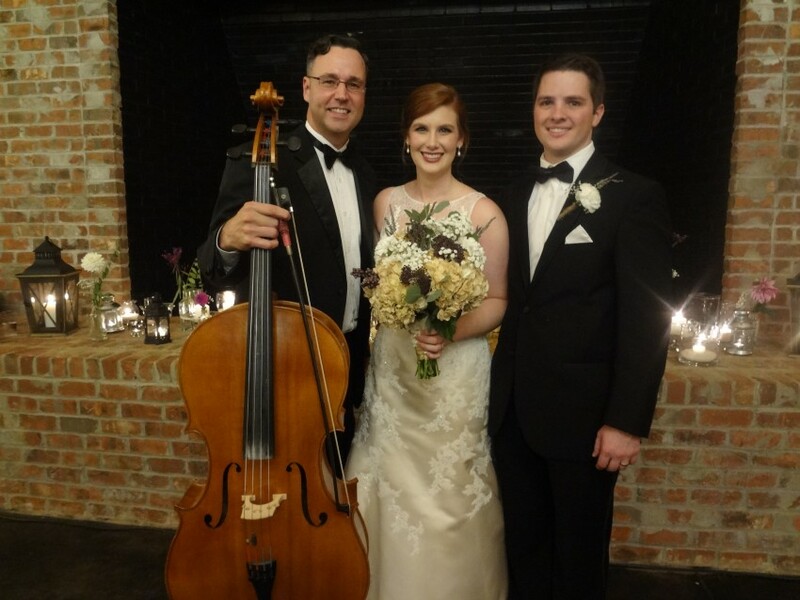 The quality of the music provided by Steve Holman and his Summit Strings and the overall professionalism of the musicians enhanced this magical moment to create special musical memories of my daughter’s wedding day. Thank you Steve for sharing you talents. I've had Summit Strings play at two events in recent years, and they were fantastic both times! Steve Holman, Summit's director, is so easy to work with. He is very detail oriented and returns emails/phone calls quickly. Steve aims to please and is always careful to find out exactly what one wants done and then makes it happen. They charge a very fair price for their service too. If you think a string quartet is too stuffy for your event, think again! They do a number of Beatles' songs and more contemporary works. We received many positive comments about Summit Strings from our guests. They are extremely talented. The group delivered wonderful emotion from "Eleanor Rigby" while making me smile and want to sing along with "Here Comes the Sun." I hate events where a band plays so loud that one cannot talk with anyone else! Summit Strings plays in the background and you can still carry on a conversation - great! For a memorable event, I would strongly recommend "Summit Strings." 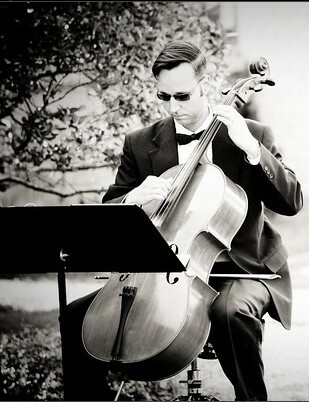 Steve Holman is an excellent cellist and leader of the SUMMIT Strings Quartet. For our wedding event he led the group to perfection. He worked with the bride and groom to select the music and performed exactly to their request with upmost professionalism. His performance is perfect as a soloist or with a group. He reviewed the music request with the bride and played every tune to maximum beauty. He coordinated the event in advance to make sure all was just as it should be for the bride and groom. He was flexible and cooperative when deciding where to be placed for maximum sound. This was no easy feat as the wedding was in a large house with a wrap around porch and half the event was on the outside porch and the other half inside. The music was simple beautiful. The ages of our wedding party ranged from 95 years to toddlers. Everyone was enthralled with the quality of the arrangements. Professional, pleasant and most of all Perfect!! We hope to use Steve Holman again for our music needs. Summit Strings performed for our wedding. We identified specific pieces in advance that we wanted for the processional and recessional and told them generally our preferences for music. They did a great job of filling out the rest of the music, and played that music well. In addition, we had one special request, which was a Chinese string quartet to accompany a tea ceremony within the marriage ceremony. Once we located the sheet music, Summit Strings learned it and did an OK job playing it. The qualification is due to two things: they messed up a part of the music - noticeably - and they didn't quit playing once the tea service was over, which we had asked them to do. We used Steve and a violinist. Very nice music for our daughter's outdoor wedding. Listen to his youtube videos. They will help you decide the type of music you want. Communicate early and often. I have booked Summit Strings for the past two years for a college commencement ceremony and have already booked them for next year! They are an audience favorite! Their music choices are extensive and are a mix of traditional and modern. Steve is professional and timely with his responses. I cannot say enough about the quality and professionalism of Summit Strings! Steve with SUMMIT Strings was a pleasure to work with, his music was beautiful and at a very affordable rate. All of our guests complimented how wonderful his performance was on guitar and cello, along with the violinist, and he was very accommodating to my song suggestions. His music made our ceremony and cocktail hour at Daniel Stowe Botanical Garden absolutely perfect! Steve did AMAZING at our wedding and everyone was who attended was very impressed!!! We couldn't have chosen a better musician. Steve made our wedding magical! Steve and his duo partner were everything we asked for and more. We were really relaxed about our wedding ceremony music, we only really picked out the processional song and we left the rest of the prelude and the recessional music up to Steve's discretion. The choices were perfect, the talent was undeniable, his flexibility with us not have much structure was impressive, and he was overall very responsive and professional both while we were booking and at the ceremony itself. I would highly recommend Steve, he will not disappoint! Steve was so helpful in making sure the ceremony music was exactly how we wanted it to be. He took extra time to prepare music and put together instrumentals and recorded sounds that made it absolutely perfect. I was so happy with how the ceremony went and everyone said the music was beautiful. Thank you Steve and Summit Strings! I cannot say enough about Steve Holman and his group Summit Strings. They are an extremely talented and professional group with a huge selection of music to choose from. They can play anything from pop and movie tunes, which we chose, or classical if you want a more formal affair. I booked a duo for my daughter’s wedding which was to be an unusual event for our area, an evening under the stars with lots of beautiful tree lights, chandeliers and wonderful music. We definitely got the music part right! Approximately ten minutes or so before the ceremony started we had a torrential downpour of rain which could have been devastating to their instruments. However, Steve and the other musician took shelter and continued to play to the delight of our guests. They certainly brought calmness to an extremely stressful situation and demonstrated an ability to handle any predicament that might come their way. As far as I am concerned, they are a “must” hire if you are having a special event. Thank you again Steve! Summit strings played as a violin and cello duo at my indoor February wedding, and they added a magical touch to the ceremony. The music was absolutely beautiful, and they even played a special song I requested for my bridal procession. I would definitely recommend to other brides! 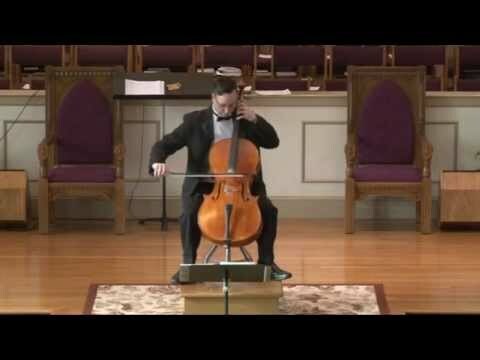 Steve Holman, Cellist, Is a wonderful soloist. When he plays it can sound like there are other s playing, as well. He has been putting on free events at the Boone Mall, Boone, NC for years and is always welcomed. As the Manager of the Mall, I am always excited to have him here. Weather he's alone or with his group, Summit Strings, it's always a very enjoyable experience for the shoppers. An unexpected treat!. We will welcome him anytime. Our lovely little library in the North Carolina mountains has commissioned Steve numerous times to perform for our patrons. Whether he brings a repertoire of holiday classics or classical concertos, we always enjoy his visits. Steve is an excellent musician dedicated to his art, and he happens to be a really nice guy, too. 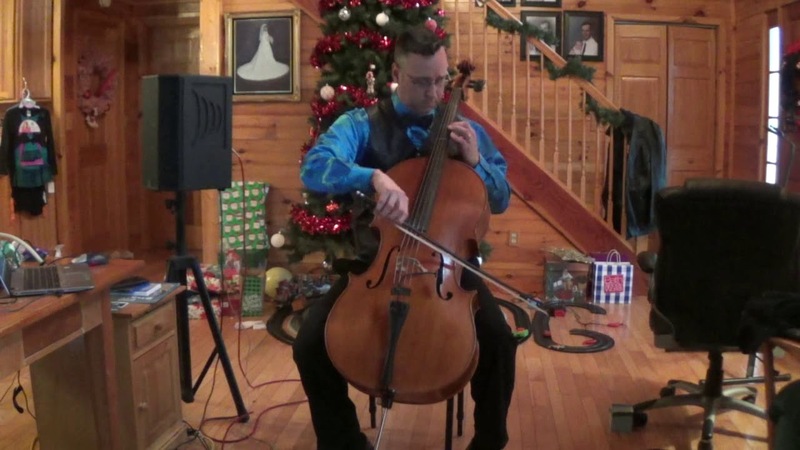 Steve is a classically trained cellist native to the mountains of Western North Carolina. Steve began his music training at the age of 8 studying Old Time Fiddle from Thornton Spencer. While in college he fell in love with the cello and started studying classically, taking private lessons and performing with the Appalachian State Symphony Orchestra. Steve is lauded for his flexibility and his love for all different styles of music. With a long list of professional colleagues in many different musical fields, Steve can provide solo cello, string ensembles, bands, singers, duets, and more.